Few skin problems are as embarrassing as body odor, and when the odor is from an unexpected place it can be even worse. Though people expect sweaty feet and underarms to smell bad, a stinky scalp can be an unpleasant surprise. If you're dealing with a smelly scalp, understanding what causes it and how to prevent it can keep embarrassment at bay. Oily hair doesn't necessarily mean a smelly scalp, but overactive oil glands in your scalp can cause a distinctive, sour odor. If you have an oily scalp, you may experience dandruff, itchiness and other skin discomforts in addition to odor, according to the American Osteopathic College of Dermatology. Odor from an oily scalp is caused by bacteria in your scalp, explains New York City dermatologist Jules Abadi in "Cosmopolitan" magazine. The bacteria is harmless and present whether you have oily hair or not, but excess oil gives bacteria the food they need to thrive and proliferate, causing odor. There are several reasons your scalp may produce more oil than is normal, explains Donnica L. Moore, women's health expert and advocate, on her women's health information website DrDonnica.com. Changes in hormone levels, stress and skin conditions such as seborrheic dermatitis can all cause you to have an oily scalp with the potential for unpleasant odors. If oiliness makes your scalp smell during the day, a dry shampoo powder can soak up excess oil to reduce odor and greasiness, says Pantene celebrity hairstylist Cheryl Marks in "Fitness" magazine. 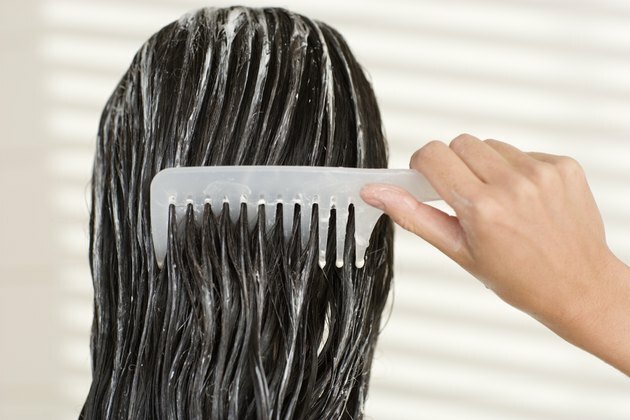 If you're dealing with a smelly scalp caused by excess oil, switching your shampoo may be an easy solution. Use a shampoo that contains sulfur, zinc or tar to soak up extra oil and odors, recommends Abadi in "Cosmopolitan" magazine. If shampoo doesn't solve the problem, Abadi suggests making an appointment with a dermatologist who can prescribe a more intense topical treatment. Cosmopolitan Magazine: A Smelly Scalp?